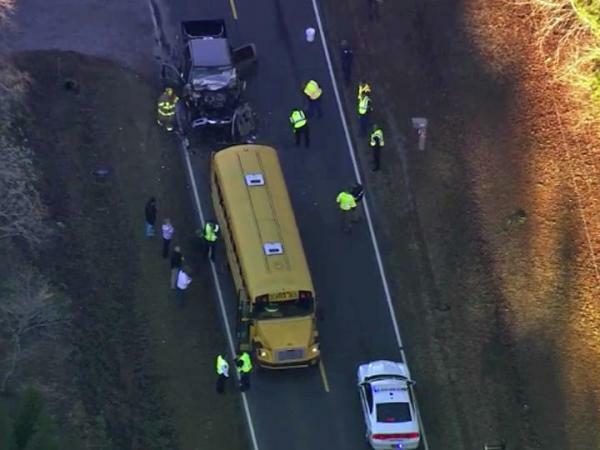 On January 31, 2013 six children were injured when a pickup truck careened into the back of a stopped school bus on N.C. Highway 42 in Sanford, North Carolina (NC). It is a miracle only four children were injured out of the thirty one on the bus. The two others injured were the 17-year-old driver of the pickup and his 7-year-old brother that was his passenger. The young driver of the pickup had to be airlifted to UNC Hospitals in Chapel Hill; his brother was transported by ambulance to the same hospital. The four children on the bus were taken to Central Carolina Hospital in Sanford. The extent of the children’s injuries has not yet been released. Authorities said the arm was extended and all warning lights were on to alert that the bus was stopped. We sincerely hope that none of the children in this needless accident suffered serious injuries. From the pictures and description it sounds like the likelihood of this accident is due to distracted driving. There are many common activities that can inadvertently cause auto accidents if performed while driving; operating a mobile device, conversations with passengers, changing the radio station, retrieving an item, carrying on another task such as make up or shaving, or even tardiness. Depending on the nature of the accident, the resulting injuries can range from soft tissue injuries (whiplash) or broken bones to more serious injuries, such as spinal cord injuries, brain injuries, amputation, or other catastrophic injuries. When you or a loved one is seriously injured in a car accident, getting to the bottom of why the accident happened is as an important factor of obtaining justice and finding closure. That’s why when choosing a Carolina injury attorney; you need someone with specialized knowledge, extensive experience and a proven track record of winning cases. Our firm published an in-depth legal guide on what to do when you’re child has been seriously injured in North Carolina (NC). Read it here.